If you’re a fan of homemade or artisan breads, you’ve probably run into inconveniences of not having a way to easily toast leftover slices. They are much longer than regular loaf bread, which are what regular toasters are designed for. So, maybe it’s time to replace your old unit with one that features slots that are longer. These slots are versatile and typically let you use one slot for one long slice or for two regular slices side by side. Our best long slot toaster reviews aim to help you choose the best toaster for your long slices of delicious bread! Take a look at a few more options for long slot toasters on Amazon. Before you read any further, you should know what features to expect and what features are considered to be “nice to haves”. Like with regular toasters, you can expect a control dial or buttons to set your preferred level of browning and you sometimes get an audible sound to let you know when the toasting cycle is over. A few models give you a defrost option as well for those who freeze their breads and bagels, and a reheat option if you just need to warm bread without toasting. The latter can fit in only extra wide slots. These are available in most long slot toasters, but you have to be sure first. Of course, you can also use a toaster oven that can also be used for grilling and baking. A toaster with long slots isn’t just a longer version of a normal one. The heating elements have to be either doubled or lengthened to ensure even toasting through the long slices. A bagel setting, if available, warms the entire bagel but only turns on the inner heating elements so that only the flat inner side gets toasted. Ensure that the unit is easy to clean and that you have storage space on your counter or in your cabinet because these units do take up a lot of space. While 4 slice toasters with two long slots are more common in this category, you can find a few single slot ones if you want to cut down on its footprint. We review one model that has some happy users. If long slots are not necessary but you just want the best 4 slot toasters on the market, then we have those too. This is a very sleek and handsome two-slice unit, and if you love Breville appliances, this Breville Lift and Look toaster won’t let you down. The extra wide and long slots at 9 3/4 inches long and 1 1/2 inches wide.are perfect for bagels, artisan breads and pastries, and they will easily fit Texas Toast too. It’s an automatic toaster, so all you’ll need to do is put the slices in the top and they will slowly lower themselves down. The handy LED strip above the adjustable lightness/darkness lever, keeps you informed of how long you have to go before your bread is toasted and ready to eat. There is even a button that will raise the toast so that you can check on how done it is, so you’ll never go wrong. Functions include the aforementioned “lift and look” button, a defrost button, a bagel button, and there is even a button that you can push that will give you 10 extra seconds of toasting time, if you want it a shade darker. The downside to all of this technology is that it isn’t cheap. Lesser priced toasters may give you the same quality of toast, they just won’t have as many buttons to push. However, this is also not one of the most expensive models either, as the body is made of plastic and not metal. A minor annoyance is that the letters on the top wear off over time, and this toaster needs to be cleaned regularly. It seems that toast crumbs jam up the automatic up and down mechanism, and the only way to free it is a sharp “tap” on the bottom. However, there is a front pull out to make cleaning easy. Be that as it may, this is one of the best long slot toaster models there is and if you are willing to pay for this convenience, you’ll be good to go. If you like the touch toaster above, welcome to its bigger sister. Unlike most 4 slice toasters with 4 separate slots, this Breville BTA830XL accommodates 4 slices by being longer. It is an interesting and versatile concept that allows you to toast almost any size or shape of bread, and it lowers everything you put into it, automatically. Everything the above Breville Touch Toaster has, this unit also has. From the “lift and look” button, to the LED readout showing how your toast is progressing, toast a bit more, a bagel button and the defrost button too. Instead of a plastic body, this model is nicer looking, with a cool-touch die cast metal body. 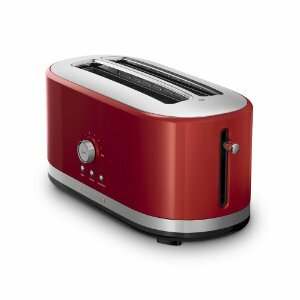 You can adjust the toast-ready alert volume and the heating wattage is higher on this model. The most interesting aspect of this toaster is the length of the slots. Virtually any sized piece of artisan bread will fit, without cutting it in half. You’ll be able to fit 4 English muffins inside, two in each slot, and for those larger pastries, like persians, croissants, danish or stollen slices, you can’t go wrong. The slots are 10″ long by 1 3/4″ wide and the depth is 6″. It also has the same quirks as its sibling too. It needs to be cleaned regularly or the toast crumbs jam up the mechanism. The bottom includes a slide out crumb tray and hidden cord storage. But if you want a do-it-all automatic toaster and aren’t afraid to shell out some seriously fine money to have it, this is the best toaster for long bread. For a 4-slice toaster, this Hamilton Beach 24810 is pretty good value for money. The long slots mean you can toast a couple normal slices of bread in each slot or you can cut two larger pieces of home-made bread or pastry, and they will fit right into each slot. The walls are stainless steel and cool to the touch. There are a couple of unique toaster features here. One is the “beep” sound whenever the toast is lowered and then again when it pops up fully toasted. If you are in another room and you hear the beep signalling your toast is done, that could be a very handy feature. It also has a “keep warm” function that keeps your toast warm for an extra 3 minutes, if you can’t get to it right away. There is also a bagel and defrost button, and it has 7 settings to make the perfectly shaded toast that you desire. The Toast Boost feature keeps your fingers safe by lifting the slices high enough for you to safely remove them. It is easy to clean and it toasts evenly. If you want to nitpick, the cord comes out the front from the storage space underneath, which can be inconvenient, and it’s only 2 feet long, so make sure you are near an outlet. It’s also not the deepest slotted toaster at 5”, but for the price, you are getting a lot of bang for your buck, and that might be reason enough to consider it for your counter top. For a beautiful toaster like none other, the KitchenAid KMT4116ER unit is lovely to behold in either silver, red or black. It comes with several functions, from a bagel button to a defrost button and it even has a reheat setting. Best of all, there is a “keep warm” button that keeps your toast toasty warm for up to 3 minutes and a pretty loud beep lets you know when it’s done. That’s great if you are in another part of the house when your toast pops up. The high lift lever lets you check the progress of your toast, just lift it out and check how it looks, and it also allows you to put in smaller pieces that you can lift out when they are done. You’ll have the same capability as with other long slot toasters. Put in 4 regularly sliced pieces of toast, or cut slices off of homemade or artisan breads of your choice, one piece for each side. Pastries work too. Although a solid unit in many aspects, a few reviews mention that it doesn’t make the most evenly toasted bread. Not that it may matter because the bread will be toasted, but if you are a stickler for having the toast look the same color all across the faces, front and back, this one isn’t that precise. Regardless of anything else, the Cuisinart 2-Slice Long Slot in an aluminium housing is the best “pure” toaster on this list. It toasts the most evenly, and the toast comes out nearly perfect on any of the 7 settings you use. You only get one extra long slot with this model, but its slim profile makes it a nice choice for small kitchens. It even gives you all the bells and whistles too. It is easy to use – just push the down button and let it go. You can lift the toast automatically with another button to check on its progress, or you can raise and lower it manually, with the convenient lever on the front. There are cancel, defrost and bagel buttons, and it has a count-down timer that shows you the progress of your toast through LED lights going off one after the other. When they are no longer lit, your toast is done and it raises up. You could, conceivably, put in 3 regular slices of toast or one slice of artisan bread and the like because the slot is so long at 9-3/4 inches. So you do get a bit of versatility with this unit. What you’ll have to determine is if it is worth the price. For a two slice toaster, this is not cheap. But if you want the best pure toasting machine for long slices with great construction that looks as good as it toasts and you are willing to pay for that luxury, this Cuisinart can’t be beat. Recently bought a long slot toaster but the heat is extremely high – too hot to have the toaster under the upper cabinet that would start a fire. Please tell me if any of your long slot toasters can toast while under the upper cabinet. I’ve never heard of a toaster causing a fire under cabinets! Must be a defective unit, as most toasters are placed on countertops and often under upper cabinets. All the toasters above have browning regulators so you can find the right setting for you.